In this interview with Anabel Gonzalez, the senior director for the World Bank Group’s Trade & Competitiveness Global Practice offers her views on mega-regional trade agreements, the role of trade in reducing inequality and the importance of international cooperation and domestic policies in making globalization work for all. AG: International trade is essential to support growth, development and poverty reduction. 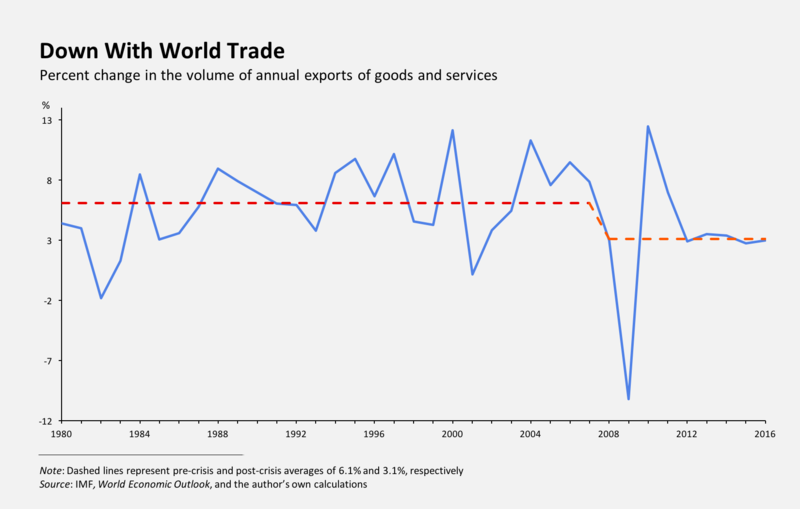 Despite recent weaknesses, since 1950 the share of GDP made up by trade and the volume of world trade have increased significantly. In 2015, global merchandise trade in value terms was 16.4 trillion –in volume terms, this is more than 3 times larger than in 1990; foreign direct investment, increasingly intertwined with trade, has grown almost seven-fold during this period. Developing countries have expanded their participation in both trade and investment flows, experiencing high and sustained growth and halving the number of people living in extreme poverty. An increasingly integrated economy coupled with technological advancements is behind these results which, notwithstanding many outstanding challenges, are quite impressive. AG: There is a backlash in some (advanced) countries against trade agreements and more broadly, globalization. Opposition may be rooted in different grounds. Some of the opposition may relate to the content of the agreement –there are provisions in these agreements that are contentious; part of it may be associated with a misunderstanding of the content of the agreements. Opposition may also arise from the perceived impacts of the agreement. Though the agreement may benefit society as a whole, there is also a concern for groups or individuals who may be impacted or who may not have the skills to take advantage of the opportunities. In the domestic political debate, opposition to trade agreements may also be used as a bargaining chip to achieve other objectives, or sometimes it may also come down to ideology. This backlash needs to be taken seriously, and it merits a response. The response can be organized around three key elements: be open, be proactive, and be engaged. By being open, I mean that some of the criticisms expressed merit consideration. For example, market opening can lead to short–term adjustment costs, which can be painful. Second is that deep integration is a different ballgame. It is not the same to eliminate tariffs as to harmonize standards. Consumer concerns need to be taken into consideration -and this is part of the discussion surrounding the negotiations of the Trans-Atlantic Trade and Investment Partnership (TTIP). The third point is that countries, and groups within countries, may need support to integrate into global markets. The second element is that governments need to be proactive to propose solutions. For example, safety nets to weather short-run effects, or education and skills for the long-run. Growth is very important. The only way in which an economy will be able to create new jobs and better opportunities is through productivity-led growth. Policies to increase productivity and sustain demand are key, both at the country level, but also at the global level. And the final element is to be engaged. One must also recognize that there is a lot of irrationality in the public discourse. The fact is that trade agreements are needed to manage increased interdependencies and that they can lead to welfare gains. Policymakers need to share evidence and to educate the wider audience, while tackling head–on some of the unfounded arguments being made. What is the future of trade agreements? AG: At 3 percent, global trade in 2015 is in its fourth consecutive year of sluggish growth relative to the pre-crisis average of 7 percent. Global trade performance is also slightly below real GDP growth. In this rather negative context, we have been observing some new energy in trade negotiations. Now, the key issue is whether these mega-regional trade agreements will facilitate the integration of developing countries into the world economy. What we have seen at the World Bank Group suggests that the TPP can deliver substantial output gains in member countries. Developing countries for instance, like Malaysia and Vietnam, are likely to get the largest benefit. But in order for them to reap the potential benefits from TPP, countries would need to complement its implementation with productivity enhancing domestic reforms that would unlock supply-side constraints, including establishing a sound business climate, reducing barriers to foreign direct investment and strengthening competition, among others. That said, there are concerns that the mega-regional agreements could undermine the relevance of the multilateral trading system. We must find creative ways of providing a new burst of energy to the system, and this includes agreements under the WTO umbrella that could then be extended to other non-members. It also means stepping up the monitoring and the evaluation of the key provisions of these agreements by the WTO and other international organizations, and then refocusing WTO negotiations on trade cost reduction—a concept that is very relevant. At the end, we must recognize, and I speak from my experience as the former trade minister in Costa Rica, that trade agreements, particularly those that are impactful, are difficult to negotiate and difficult to approve in Congress. There is normally a big political discussion that surrounds these agreements, but the fact that these discussions are strong and lively is positive. It is positive because it can lead to a better understanding of the content of these agreements, what needs to be done to maximize their positive impact and also what would need to be done to address potential unintended consequences of the agreement. Are we seeing a backlash against trade agreements? AG: There are different actors and different stakeholders in the public discussion in different countries, and they bring their views—their very important views—to the table and negotiations must follow their course. But it is important to bear in mind that for trade to continue to deliver its economic benefit, it must be underpinned by strong rules and disciplines to support the integration of markets. Globalization requires these rules to be able to deliver on its economic benefits. It is through multilateral cooperation and economic integration, through trade agreements, that we will be in a better position to manage globalization. In parallel to international cooperation, domestic policies in the areas of education, health, safety nets, better business environments, and improved infrastructure –are important to make globalization work for all. AG: Inequality is a complex phenomenon. It is the result of multiple and diverse economic forces. It is difficult to define, to measure and to compare across countries. But, it is important to distinguish two different dimensions of inequality. First, we have what we call global inequality. That is inequality across persons in the world irrespective of their country of residence. Second, is inequality across persons within an individual country. Global inequality greatly exceeds inequality within any individual country. A recent World Bank Group study by Lakner and Milanovic found that global inequality remains very high. However, global inequality has declined markedly since the 2000s. This is explained in large part thanks to the rising fortunes of the developing countries, in particular, China, but to a lesser degree, India and others. Trade is very much behind the success of these developing countries. However, more trade is needed to eliminate poverty and to reduce global inequality. The second dimension of inequality is inequality within individual countries. Since 1990, there have been studies, including those conducted at the Bank Group, which have shown that inequality has risen in advanced countries, with a few exceptions, and in some developing countries. And this is, of course, a subject of widespread concern, not only because of the issue of inequality, but also because of the impact that this may have on efficiency. The discussion here, again, is one related to what domestic policies need to be put in place to help mitigate inequality, including better access to education and healthcare and well-targeted social policies that can help raise the income share for the middle class. It is important to remember, though, that there is no one-size-fits-all approach to battle inequality. Most developed countries have the human and economic resources to develop and implement equality policies in these areas. In the case of many developing countries, the least developed in particular, international cooperation is fundamental. At the World Bank Group we are working with governments and the private sector to tackle very entrenched constraints that keep poor people from connecting to markets and from benefiting from wider economic gain. Are we seeing a roll-back of globalization? AG: Throughout history we have seen that it is sometimes easier for policymakers to blame domestic problems on foreigners. That is the tendency that underpins protectionism or isolationism. But the reality is that any quick measures that aim at keeping foreigners at bay –be it goods or services, capital, ideas, or even people—is like attempting to find a quick fix. And there are no quick fixes. There are difficult and important questions that need to be answered on how to deal with dislocation costs and how to bring all into the benefits of trade.